LARENCORE: U.S : Stand with Maxine WATERS : let the GOP and Dems know that we have her back ! U.S : Stand with Maxine WATERS : let the GOP and Dems know that we have her back ! Civil disobedience in the face of hate is a duty, civility a choice. Sign now and leave a comment to let Maxine know that we have her back ! Rep. Maxine Waters is calling for an end to business as usual when bigotry and hatred are becoming the norm and that is exactly the kind of leadership we need right now.Instead of fighting against a growing violent agenda, too many Democrats are wringing their hands in uncertainty and attacking Maxine Waters on civility instead of being the leaders we need and deserve. Take action now to let the Dems know they need to #BeLikeMaxine. Write a comment and we will get it to Maxine Waters, Pelosi, Schumer and other Members of Congress. Republicans stole a Supreme Court seat that led to the Supreme Court passing the Trump’s #MuslimBan today1. The Trump Administration stole babies from their parents, put them in cages and called those cages summer camps last week2. And through their actions, the Trump Administration has stolen any sense of security and safety for millions of Americans. When immoral and monstrous acts become the norm, we have a duty to put the social construct of politeness aside and fight like hell for justice in any way we can. The calls for false peace and civility that establishment Dems like Schumer and Pelosi, who called Waters statements “unacceptable”, tells us what side they have chosen; their own 5. They are more invested in maintaining their own power and the status quo than they are of fighting against an Administration that steals children, attacks immigrants and bans Muslims. Sign now and write a comment to Maxine telling her that we have her back, even if the Dems don’t. We need fearless leaders in the face of a tyrannical and fascist state! A powerful Black woman not afraid to speak the truth is a terrifying thing to Trump, who posted a tweet attacking Waters with an implied threat while GOP members have called for a measure to censure her, demanding her resignation6. Trump and the GOP have a vested interest in removing anyone who vocally opposes their agenda, and the silence on the part of the Dems is deafening. Now more than ever, we need defenders of true democracy and courage in the face of hate. 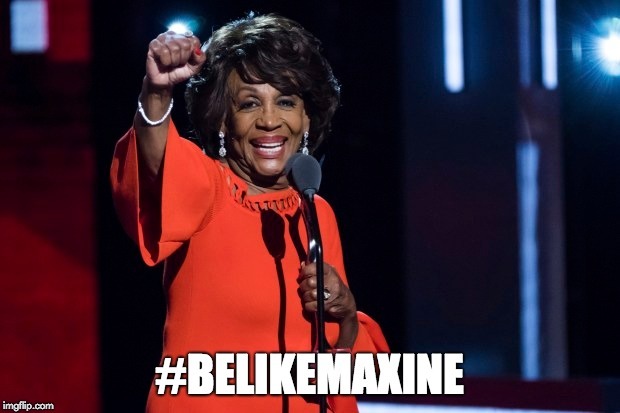 We need more people to #BeLikeMaxine. Civil disobedience is a duty, civility a choice. The moral compass of this country is drastically failing. Civil disobedience and protest is our responsibility and our right. Decades ago, Martin Luther King Jr. told us that the threat of the KKK was not as severe as the growing danger of the “white moderate who is more devoted to "order" than to justice; who prefers a negative peace which is the absence of tension to a positive peace which is the presence of justice” 7 ? We have a duty to fight for the future we believe in, and that starts when we take action today. Right now, this is our chance to fight for Maxine Waters the way she fights for us. Sign now to #BeLikeMaxine. Write a comment to Rep. Maxine and we will make sure to deliver it.